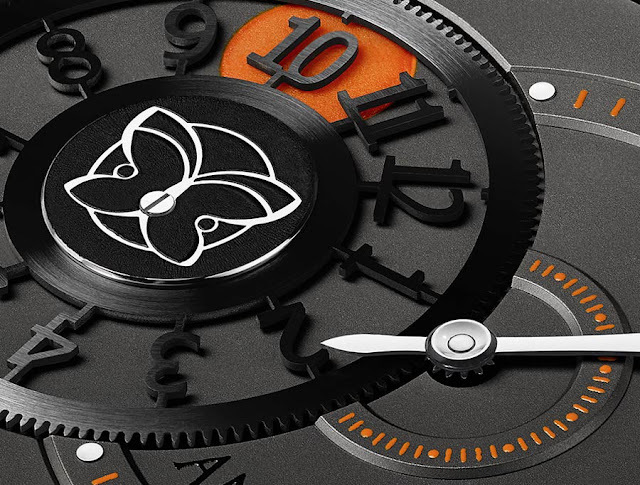 Limited to just eight pieces, the new Time Shadow model created by independent watchmaker Andreas Strehler reduces the indication to hours and minutes but offering a truly unique dial layout. The hours are indicated by a black rotating disk, finished in wire-cut, which turns around a small disk with the typical Andreas Strehler butterfly logo at the centre. This black disk is actually a gear wheel, directly linked to the gear wheel of the minute hand. The current hour is shown by the cut-out numeral positioned over a luminous orange dot which creates a nice contrast against the matt black background of the dial. When the minute hand leaves the main minute scale ranging from 55 to 35, the minutes can be still read precisely thanks to a rearward extension of the hand that sweeps a smaller secondary scale. 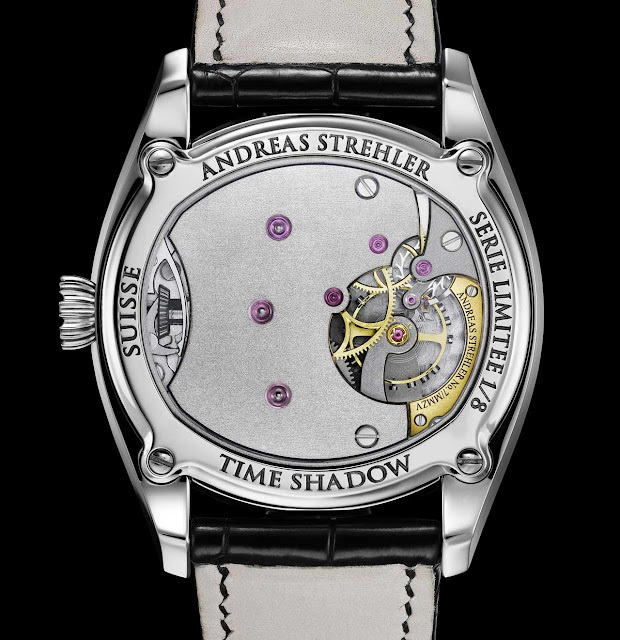 The 5/8-bridge of the 3 Hz (21,600 vph) movement is designed to emphasise specific features of Andreas Strehler’s watches, and in particular the escapement, the true conical gear wheels of the winding mechanism and the large second wheel. The rare grainage-finishing of the main bridge requires great skills and error-free execution as no mistakes or scratches can be re-polished. 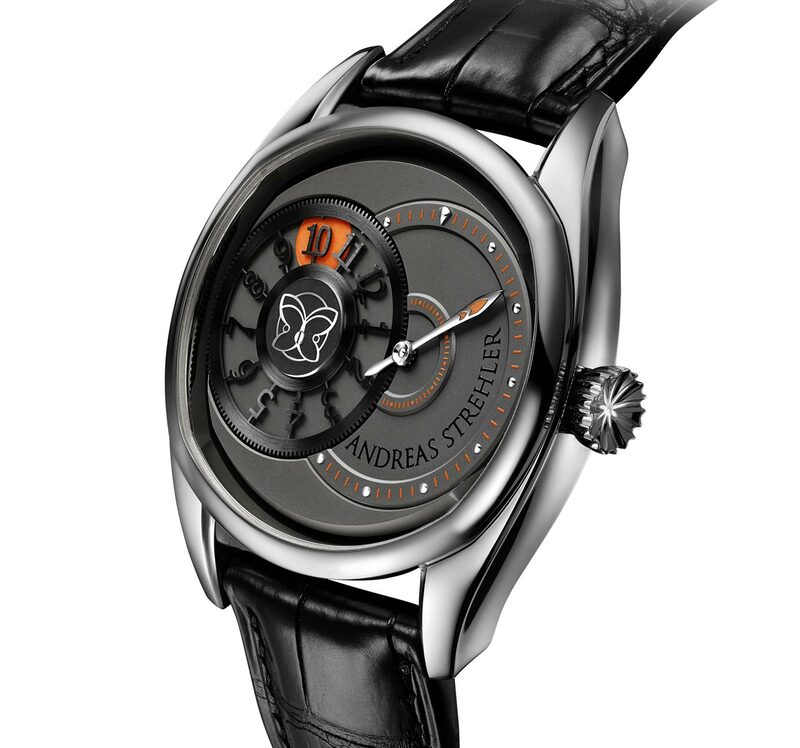 The typically shaped 41.00 mm x 37.30 mm case is crafted from stainless steel, a first time for an Andreas Strehler timepiece. 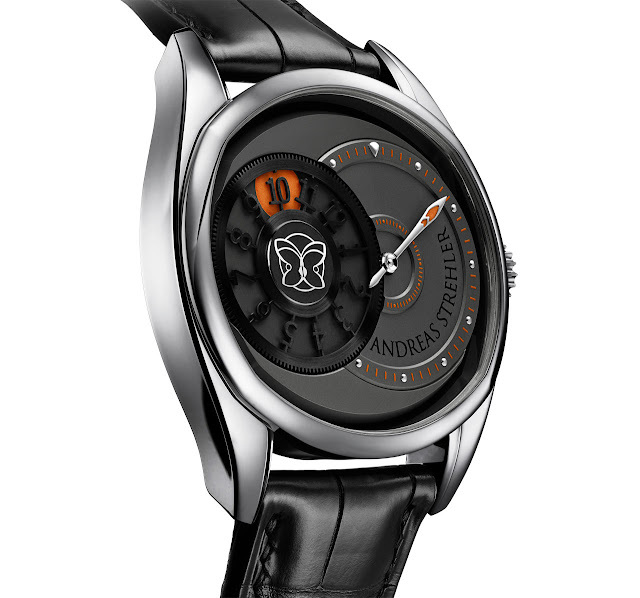 Andreas Strehler Time Shadow. 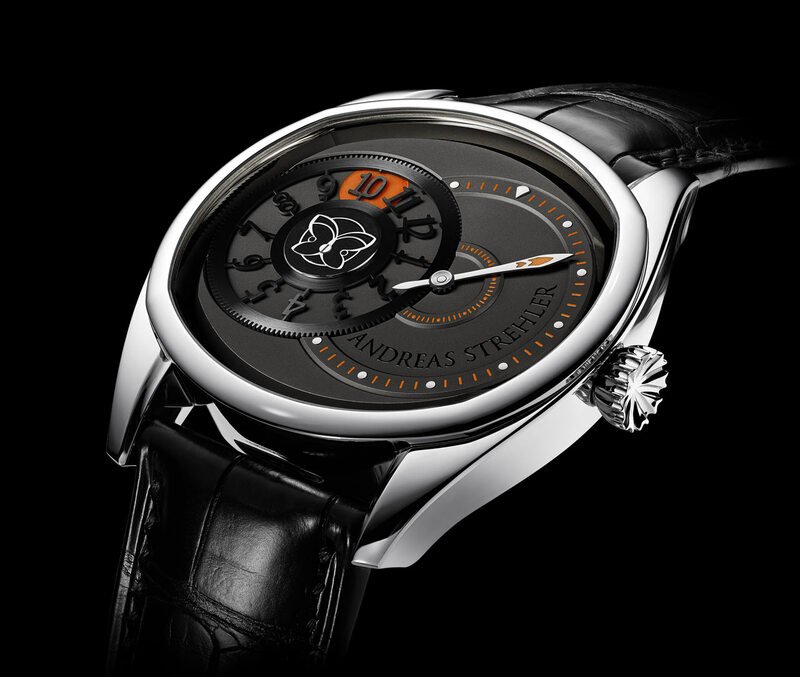 Limited to just eight pieces, the new Time Shadow model created by independent watchmaker Andreas Strehler reduces the indication to hours and minutes but with an original dial layout. 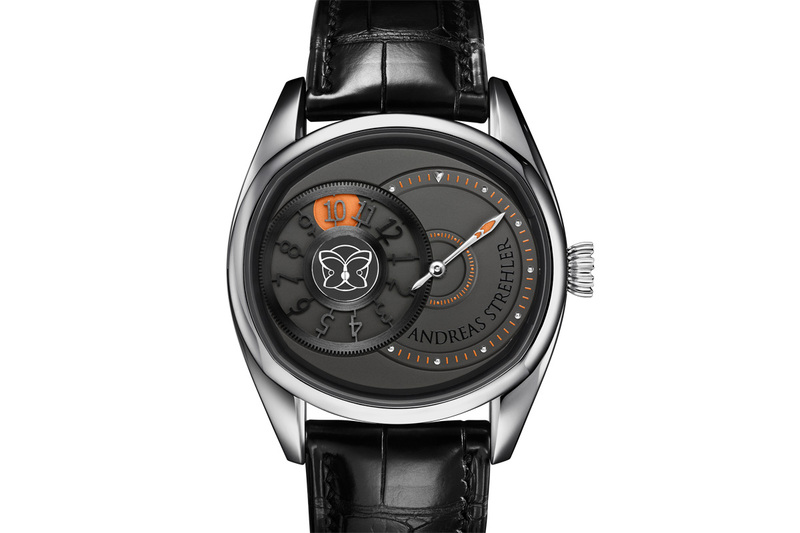 The price of the Andreas Strehler Time Shadow is Swiss Francs 56,000.